Haggis, Weeps and Tati … | Scots Whay Hae! 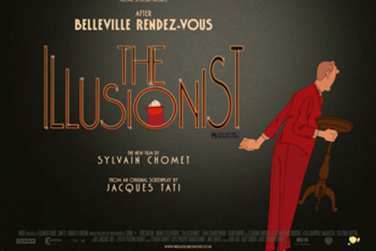 Scottish cinephiles have been waiting for the release of Sylvian Chomet’s latest feature The Illusionist ever since it was first rumoured that he was working in Scotland. Coming seven years after the hugely successful Belleville Rendez-vous, The Illusionist was four years in the making and is one of the few animations to be (mostly) set in Scotland. I’m pleased to report that it is a beautiful and gentle film, one to luxuriate in. The pace of the film is rare these days in that it in no way attempts to rush the audience through the simple story and the animation is understated but absolutely gorgeous. Based on Jaques Tati’s never produced script, one that was reportedly written for his daughter Sophie (although there is some debate about this), this film is about life moving forward, the passing of time, expectation and disappointment, and the changing nature of love. The Illusionist is one of those films that becomes more moving the further you get from the cinema. The initial impression is that while it is a lovely piece of animation the story is slight and perhaps lacks emotional content. But the slow build of the film, culminating in the leaving of Scotland, expresses a sense of loss that is not fully realised until you have time to regard what you have seen later. In that sense this a wonderfully subtle film. The central relationship is between the Illusionist and his ‘adopted’ ward; a young Gaelic speaking girl who follows him to Edinburgh. Their relationship is never sleazy or untoward, theirs is a familial bond and it reminded me of the similar relationship between the young Mathilda and Jean Reno’s hitman in another French film, 1994’s Léon. In The Illusionist the girl becomes a surrogate daughter to him, and when she moves her affection to a local lad (who is the spitting image of a young Sean Connery) it is a sign that she is growing up and he must let her go and move on. There are lots of lovely touches and scenes in the film. The bare bum of the drunk Scot as his kilt is raised by the wind, the Jaques Tati film Mon Oncle playing in the Edinburgh cinema, the scene where the acrobats help to paint the soap poster and the running joke of the reluctant rabbit. As you would expect from this director there is care in every shot, and what is notably remarkable is the lighting that helps give each place visited its own individual character. The Illusionist is a throwback to old Disney, and not only in terms of style or animation. It reminds me of that period when Wolfgang Reitherman was directing their animated films, particularly The Aristocats, my favourite Disney film, and One Hundred and One Dalmatians. What sets it apart is that this is an adult film. It was said that the recent Disney/Pixar animation Toy Story 3 brought many parents in the audience to tears as it dealt with the passing of childhood. The Illusionist touches on the same emotions but from the ‘parents’ point of view. It is ultimately a film of regret, and it is not until you have time to reflect upon it as a whole that you realise that regret is in every frame. Go and see The Illusionist. It may not change your life but it is cinema like they just don’t make any more. There is something magic about it and that alone is a reason to buy a ticket.